• Personalize tracks to create your signature sound TRAKTOR KONTROL F1 - Overview Luciano in Ibiza with TRAKTOR KONTROL F1 READY TO REMIX Unleash your creativity. TRAKTOR KONTROL F1 delivers hands-on, live remixing with TRAKTOR's integrated Stem Decks and clip-based Remix Decks. Deconstruct and reconstruct with ultimate control of TRAKTOR PRO's Remix and Stem decks. ULTIMATE CREATIVE CONTROL Deconstruct and reconstruct with TRAKTOR KONTROL F1. Capture and load all your favorite loops and samples on-the-fly into Remix Decks. Any sound imaginable becomes a building block for your own remix masterpiece. Or explore a new way to mix with your tracks using the F1 with Stems - a new multi-channel file format for creative mixing. CLASSIC KONTROL REMIXING Manipulate and rearrange your creations with vinyl and CDJ decks you already know. Using TRAKTOR KONTROL F1 with TRAKTOR SCRATCH PRO 2, fuse classic DJ workflow with an element of live performance - and mix with your edits on wax at any moment. A CLOSER LOOK MIXING 4 dedicated filter knobs, one per Remix Deck slot or Stem part. Plus 4 robust faders deliver precision volume control for individual Remix Deck or Stem Deck channels. GLOBAL Load entire Remix Sets instantly or browse and load individual sounds or Stem files from TRAKTOR's browser. Scroll through 4 pages of 16 pads with the push encoder. Capture loops live from running track decks. CREATIVE Trigger Remix Deck loops and samples with 16 multi-colored pads. Pressing the Shift button accesses functions like Punch mode and FX assignments. The smaller pads at the bottom mute a slot or stem. And keep watch on your Stems' volume - the pads act as level meters for a loaded Stem file. STEMS-READY TRAKTOR KONTROL F1 is the gateway to mixing with Stems - the open, multi-channel audio format for creative DJing. A Stem file contains a track split into four musical elements - bass, drums, vocals, and melody, for example. With each element available independently, you can create spontaneous edits, mash-ups, instrumentals, and more. Bring track elements in and out of the mix with the F1's volume faders, buttons, and filter knobs. Get detailed with effects using 16 color-coded pads. All while watching your Stems levels in real-time - the pads light-up as level meters for each stem. MORE ABOUT STEMS REMIX DECKS AND REMIX SETS Get creative with your music. Remix Decks let you slice, loop, edit and deconstruct tracks - powerful performance tools directly accessible from the F1. Ready-made Remix Sets from top artists are the fuel behind Remix Decks - released online for download. Instantly remix your favorite artists and create your signature sound. DESIGNED FOR TRAKTOR PRO 2 Take your set to new heights with the flagship TRAKTOR PRO 2 software. Mix with up to four decks plus a stunning range of creative features for maximum mixing freedom. 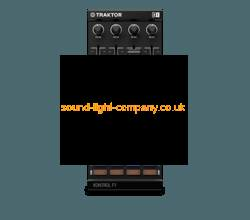 TRAKTOR KONTROL F1 with X1 controller for dedicated decks and Stem or Remix Decks control. TRAKTOR AUDIO 2's second stereo output is used for monitoring. THE PRESS ON TRAKTOR KONTROL F1 "Having used the Traktor Pro Remix Decks with the Kontrol F1, I don't want to go back to Traktor without it." DJ TechTools "The Kontrol F1 breaks the barriers without breaking the bank." Earmilk WIDE WORLD OF TRAKTOR Explore the wide range of cutting-edge, professional DJ hardware and software that is TRAKTOR.